Appendix Epiploica; Inflammation; Diagnosis; Radiology. Primary epiploic appendagitis (PEA) is a relatively uncommon, non-surgical situation that clinically mimics other conditions requiring surgery. In PEA, torsion and inflammation of an epiploic appendix results in localized abdominal pain. This condition may be clinically misdiagnosed, resulting in unnecessary surgical intervention. We report the unusual case of a healthy 44-year-old man, who presented to the 417 NIMTS Military Veterans’ Fund Hospital of Athens with non-migratory left lower quadrant abdominal pain, which had started 24 hours before admission. The patient described a constant, sharp, non-radiating pain. He had no symptoms of nausea, vomiting, constipation, diarrhea, or fever. Abdominal examination showed focal abdominal tenderness with slight rebound tenderness. The diagnosis of PEA of the sigmoid colon was made based on the findings of an abdominal contrast computed tomography (CT). The key findings of CT were an oval lesion with a maximum diameter of 2.4 cm, with fat attenuation, and a circumferential hyperdense ring located adjacent to the sigmoid colon. This case is presented to highlight the clinical characteristics of PEA, which may help clinicians to overcome this diagnostic dilemma and reach the correct diagnosis. Inflammation of epiploic appendices, primary epiploic appendagitis (PEA), is a rare cause of acute abdomen.2 It has been described as an inflammation resulting from spontaneous torsion, subsequent ischemia, and eventually gangrenous necrosis of the appendage or by primary thrombosis of the draining vein and inflammation.3 Depending on the site of occurrence, it can mimic any cause of acute abdomen and can be a source of diagnostic dilemma. Here we report an unusual case of a 44-year-old male with PEA of the sigmoid colon. We discuss the presenting symptoms, diagnostic evaluation, management, and the measures to overcome this diagnostic dilemma and review the relevant literature. A 44-year-old male presented with left lower quadrant pain, which had started 24 hours before admission to the 417 NIMTS Military Veterans’ Fund Hospital of Athens, Greece. The patient described a constant, sharp, non-radiating pain with a severity of six out of 10. There were no symptoms of nausea, vomiting, constipation, diarrhea, or fever. He had no past medical history. Abdominal examination showed focal abdominal tenderness with slight rebound tenderness. The only laboratory value of significance was a slightly elevated C-reactive peptide (CRP) count of 1.1 mg/dL (< 0.5 mg/dL). An abdominal contrast computed tomography (CT) was performed and revealed an oval lesion with a maximum diameter of 2.4 cm, with fat attenuation, and a circumferential hyperdense ring located adjacent to the sigmoid colon [Figure 1]. A diagnosis of PEA was established. The patient was commenced on ciprofloxacin 250 mg and metronidazole started 500 mg, twice daily. Within two days his complaints resolved and further recovery was uneventful. 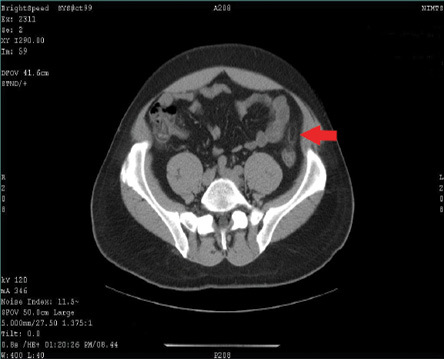 Figure 1: Abdominal contrast CT revealed the inflamed lesion adjacent to the sigmoid colon while an oval fatty mass with a hyperattenuating ring was noted (red arrow). PEA is a rare cause of acute abdomen. In a reported series of 1,320 cases of acute abdominal pain, only eight cases were due to PEA.4 It usually occurs in the fourth and fifth decades of life, predominantly in men.5 Clinical symptoms include sudden focal non-migratory abdominal pain and tenderness, postprandial fullness, and epigastric discomfort.6,7 Fever, diarrhea, vomiting or signs of peritonitis are rarely observed. In our case, the patient started to experience pain 24 hours before his admission. He described his pain as constant, sharp, and non-radiating with a severity of six out of 10. He denied any symptoms of nausea, vomiting, constipation, diarrhea, and fever. Laboratory findings may include slightly elevated leucocytes and CRP. In a study of 28 patients having PEA with symptoms localized in the left quadrant of the abdomen, elevated white blood cells and CRP were reported in only 15.4% and 7.1% of the patients, respectively.8 In our patient, the only laboratory value of significance was a slightly elevated CRP. Radiological examination plays a fundamental role in the differentiation of PEA from other conditions with similar clinical features. CT mostly shows a fatty ovoid pericolonic mass with a hyperdense ring (the hyperattenuating ring sign), which depicts the inflammation of the peritoneal covering of the appendage.9 Singh et al,10 described a hyperdense central line inside the inflamed appendage in 54% of patients. This finding probably corresponded to either a thrombosed vessel or fibrous septa. Furthermore, bowel wall thickening or compression was apparent in 21% of the patients with PEA in a study that presented the color Doppler sonographic findings of PEA.11 Magnetic resonance imaging (MRI) can contribute to an accurate diagnosis even though it is not the diagnostic modality of choice. In both T1- and T2-weighted MRI, a fat intensity mass attached to the colon is apparent.12 In our case, the abdominal CT led to the diagnosis of PEA. Surgical involvement is justified only in complications of PEA or in recurred cases.14PEA is a self-limited disease and most symptoms subside spontaneously within a period of one week (mean 4.7 days).15 Antibiotics and nonsteroidal anti-inflammatory drugs (NSAIDs) are sufficient as the treatment of choice. In our case report, we decided to manage the patient conservatively. He received a course of antibiotics for seven days. His complaints resolved during the next two days, and further recovery was uneventful. PEA presents with an abrupt onset of focal abdominal pain and tenderness without significant guarding or rigidity and without associated leukocytosis. Because of its rarity and lack of pathognomonic clinical signs, PEA can pose a diagnostic dilemma and confuse clinicians. Evaluation by CT can distinguish PEA from other conditions with similar clinical manifestations. Surgeons should be aware of this disease and keep it as a differential diagnosis in cases of acute abdomen. A combination of awareness about this condition and clinical experience can help clinicians to avoid unnecessary surgical interventions. Most patients recover with conservative management only. Sand M, Gelos M, Bechara FG, Sand D, Wiese TH, Steinstraesser L, et al. Epiploic appendagitis–clinical characteristics of an uncommon surgical diagnosis. BMC Surg 2007;7:11. Legome EL, Belton AL, Murray RE, Rao PM, Novelline RA. Epiploic appendagitis: the emergency department presentation. J Emerg Med 2002 Jan;22(1):9-13. Golash V, Willson PD. Early laparoscopy as a routine procedure in the management of acute abdominal pain: a review of 1,320 patients. Surg Endosc 2005 Jul;19(7):882-885. Malik KA. Torsion of an epiploic appendix pretending as acute appendicitis. Oman Med J 2010 Jul;25(3):225-226. Choi YU, Choi PW, Park YH, Kim JI, Heo TG, Park JH, et al. Clinical characteristics of primary epiploic appendagitis. J Korean Soc Coloproctol 2011 Jun;27(3):114-121. Almeida AT, Melão L, Viamonte B, Cunha R, Pereira JM. Epiploic appendagitis: an entity frequently unknown to clinicians–diagnostic imaging, pitfalls, and look-alikes. AJR Am J Roentgenol 2009 Nov;193(5):1243-1251. Jalaguier A, Zins M, Rodallec M, Nakache JP, Boulay-Coletta I, Jullès MC. Accuracy of multidetector computed tomography in differentiating primary epiploic appendagitis from left acute colonic diverticulitis associated with secondary epiploic appendagitis. Emerg Radiol 2010 Jan;17(1):51-56. Hwang JA, Kim SM, Song HJ, Lee YM, Moon KM, Moon CG, et al. Differential diagnosis of left-sided abdominal pain: primary epiploic appendagitis vs colonic diverticulitis. World J Gastroenterol 2013 Oct;19(40):6842-6848. Ozkurt H, Karatag O, Karaarslan E, Rozanes I, Basak M, Bavbek C. CT findings in epiploic appendagitis. Surgery 2007 Apr;141(4):530-532. Singh AK, Gervais DA, Hahn PF, Rhea J, Mueller PR. CT appearance of acute appendagitis. AJR Am J Roentgenol 2004 Nov;183(5):1303-1307. Danse EM, Van Beers BE, Baudrez V, Pauls C, Baudrez Y, Kartheuser A, et al. Epiploic appendagitis: color Doppler sonographic findings. Eur Radiol 2001;11(2):183-186. Sirvanci M, Balci NC, Karaman K, Duran C, Karakaş E. Primary epiploic appendagitis: MRI findings. Magn Reson Imaging 2002 Jan;20(1):137-139.
van Breda Vriesman AC, Puylaert JB. Epiploic appendagitis and omental infarction: pitfalls and look-alikes. Abdom Imaging 2002 Jan-Feb;27(1):20-28. Romaniuk CS, Simpkins KC. Case report: pericolic abscess secondary to torsion of an appendix epiploica. Clin Radiol 1993 Mar;47(3):216-217. Christianakis E, Paschalidis N, Filippou G, Smailis D, Chorti M, Rizos S, et al. Cecal epiploica appendix torsion in a female child mimicking acute appendicitis: a case report. Cases J 2009;2:8023.